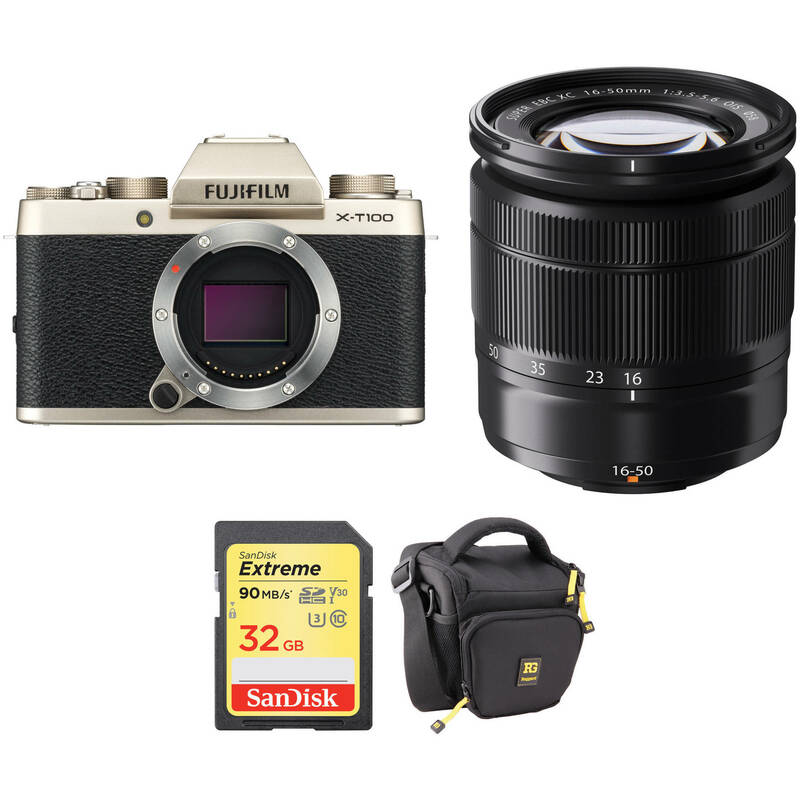 Comprising the essentials needed to begin shooting, the champagne gold FUJIFILM X-T100 Mirrorless Digital Camera with 16-50mm Lens and Accessories Kit from B&H bundles the sleek mirrorless body and standard zoom lens with a memory card and a camera bag. Covering wide-angle to portrait-length focal lengths, the black XC 16-50mm f/3.5-5.6 OIS II Lens from Fujifilm provides a 24-76mm equivalent focal length range and is designed for use on their APS-C-format X-series mirrorless digital cameras. The standard zoom range is complemented by optical image stabilization, which minimizes the appearance of camera shake to render sharper imagery at longer focal lengths and when working with slower shutter speeds. The optical design features three aspherical elements and one extra-low dispersion element to help minimize chromatic aberrations and distortions and a Super EBC coating has been applied to reduce ghosting and flare for clearer, more color-accurate results. Box Dimensions (LxWxH) 7.5 x 7.25 x 4.25"
Box Dimensions (LxWxH) 6.5 x 4.4 x 4.0"